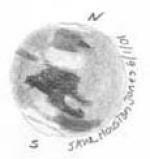 Mars sketch by Jane Houston Jones from the most recent opposition. Sketched on June 1, 2001. Congratulations to the proud parents of one of our newest asteroids, (22338) Janemojo! It's far away from us now, so we won't be able to see it this month in amateur sized instruments, but it's a hefty planetoid and I'm looking forward to trying for it some time when it's closer! Mars rises as the evening begins, and is visible for the rest of the evening. It should be big enough to be showing some detail now: it begins the month at 16 arcseconds, roughly the same size as Saturn, and ends the month at 20". It's still quite low in the sky, though, reaching only about 30 degrees elevation by dawn, so it may be difficult to catch it in steady air. Still, it's a good time to start looking: any practice you get now identifying elusive features on Mars will pay off well in August when the planet is closest to us. It's spring in Mars' southern hemisphere (the one pointed toward us), and the south polar cap should be shrinking fairly rapidly now. If you stay up late you can probably get a good enough view to watch this happen. Meanwhile, it's possible that we may be able to catch a glimpse of the growing northern polar cap, even though it's tilted away from us, and for changes in the shading of Hellas and Syrtis Major. Jupiter is still visible, low in the western sky at sunset; it will drop lower as the month progresses until we lose it in the sun's glare. Good-bye, Jupiter! Mercury will be visible low in the west-northwest shortly after sunset during the last week of July. If you're having trouble finding the elusive planet, try it on the 26th, when it should be easy to locate less than half a degree north of Jupiter, close enough to get both in the same low-power telescope field. This should make for a good public star party show, too, both on that Friday and the day after. Saturn moves into the morning sky this month, but never gets very far from the sun. Venus, also nearly lost in the morning glare, is moving the other way, disappearing behind the sun by month's end. Uranus (in Aquarius), Neptune (in Capricornus), and Pluto (in Ophiuchus) are all well placed for observing this month.